Automatron was made to solve many of the frustrations that I encounter when doing character animation. One of the biggest frustrations is dealing with a complex character rig. Hunting around the scene, un-hiding and selecting parts of the rig and unfolding countless interface rollouts just to lay a few keys or adjust controllers can eat up a huge amount of creative energy. That wasted time had to be spent elsewhere, you know, making animation. At first glance of the interface, there are a huge amount of buttons and spinners. This may seem over the top, and I admit it is, but after a short learning curve youll come to realize that every button is there for a good reason and sits right where you need it. When animating with Automatron, I rarely need to go elsewhere in the 3dsMax interface to do much of anything but render. 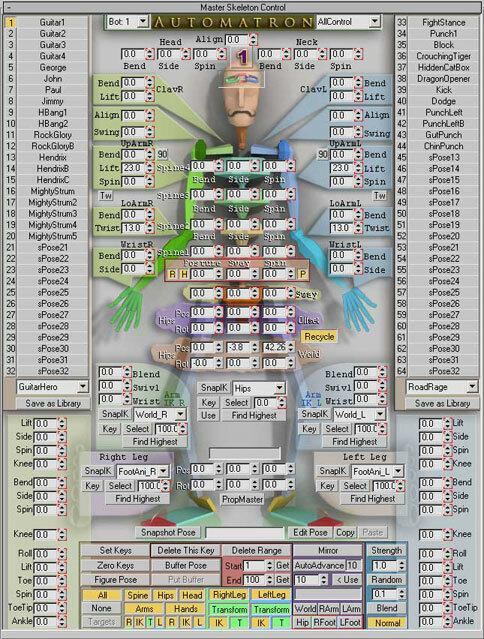 Automatron was created in MaxScript and the Rig is made up of only 3dsmax objects and 3dsmax controllers. That means your Automatron will be forward compatible with any copy of 3dsmax8 and up, even if you dont have Automatron. There are no plugins to install on net-render machines, and you can freely send your Automatron scenes to colleges and clients without the need of them having the Automatron Tool. Its all made with Max. You can even animate the Automatron rig without the Automatron Tool, its just a lot more time consuming.